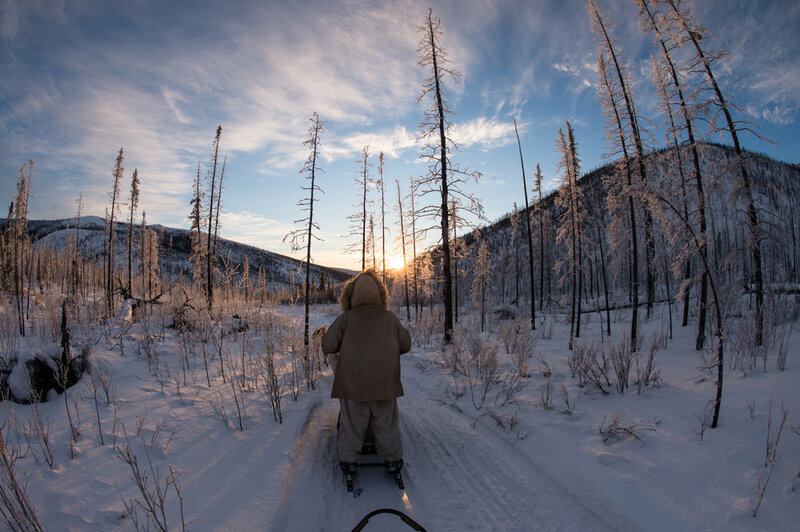 While winter is a the dominant season in Alaska, we do have 4-5 snow-free months each year. What do the poor dogs do without snow? Mostly summer is their time to play and re-charge. For exercise in the summer we let the dogs run around with us one or two at a time. Ursa and puppy Bruce Lee explore the willow bar below our camp just after spring breakup. Lots to explore! We also boat the dogs to various islands in groups of four to play and stretch their legs. Dogs explore "sled dog island"
They like getting in the river to cool down and drink. This works great...mostly. Three of our dogs- Yawp, Eowyn and Bruce Lee enjoy swimming and if they see something particularly alluring, say a dead fish, they are apt to swim the river to get to the other side! The dogs really like riding in boats, but to do it safely we need to tie them in so they don't all run to one side of the boat at the same time and flip it. Especially clumsy non-swimming dogs sometimes get a lifejacket. 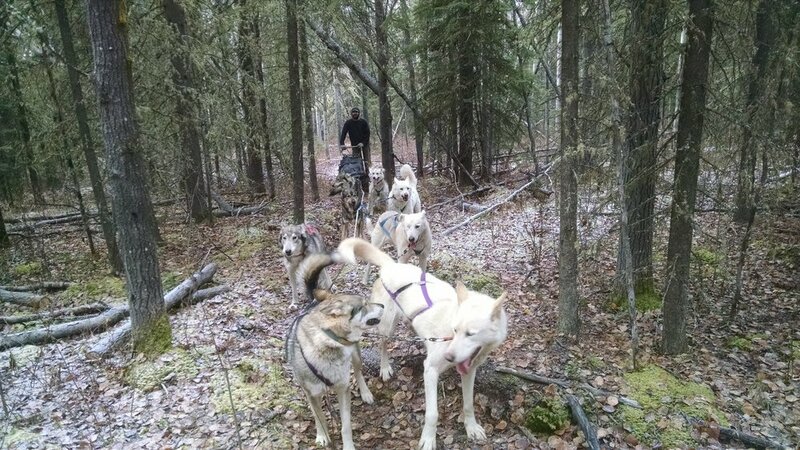 In addition to moving them around for fun and exercise, moving the eight dogs in the summer between our cabin in Fairbanks and homestead on the Tanana River is a logistical challenge. Step 1: Load the cars into their dog boxes in the trailer and drive them to the river. Here is an image of our old set up (left): dog box on truck. That worked well for years but it gets hard on the dogs to jump all the way up into the boxes and hard on the truck's suspension. Our friend Anita gave us a trailer which David converted into a dog trailer (right). We really like this system because it gives us more space in the truck and is easier for the dogs to get in and out of. Old system: Dog box on truck. New system: Dog trailer pulled by truck. 2 sleds can be mounted on this as well as a storage container. It now has 8 boxes. While the boxes are made for one dog, sometimes two try to jump in the same box! Step 2: Drive to the boat launch and load the dogs into 2 boats. Tie them in! The dogs really enjoy the ride downriver, lots to smell. Of course, we can't always travel the river. During fall and spring when the river is freezing up or breaking up we have to take dogs on our overland trail out. This year we left on October 17 to go to town and get a puppy. We pulled the boats out of the water but hadn't gotten snow yet. Our options were to walk dogs 2-3 at a time, some on a leash, some running free but this would take multiple trips and we had heavy gear to get to town..so we hitched them up like it was winter. It worked great on the uphill trail but there was no way the break would work on the downhill. We released the dogs a few at a time and Jenna put them in the dog box at the bottom of the hill. David then mushed down with just Eowyn pulling. Moving around 8 dogs is a lot of work in the summer, but having them with us is worth the effort...especially in winter.